Thanks first of all to Amanda for asking me to be a guest on her blog today. I have to admit this is my first time doing a guest post so I hope you all enjoy it. My name is Allison or as people call me online Ally. I starting my blog Ally’s Helpful Hints For Mommies just over a year ago. I was emailing friends and family diaper points from Huggies and Pampers and it took a lot of time to remember who wanted what. I told my husband there has to be an easier way and also a way to help more than my friends and family too. We named the page and he helped me get my blog set up and started. I blog about what is fun and useful to me as a mommie and hopefully as I do this I am able to help others at the same time. I have a Facebook page also and we love to post questions and have other mommies help us answer them. It has been a great community of mommies encouraging and helping each other. 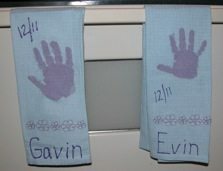 I am a stay at home mom of two boys, Gavin who is four and Evin who is two. 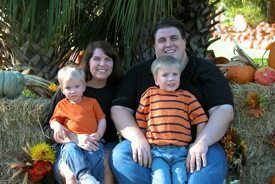 My two boys and my husband Shane are my life and I wouldn’t change a thing. My day revolves around taking care of them and enjoying every minute God has blessed me with them. We live in Florida so we enjoy very hot weather most of the time! 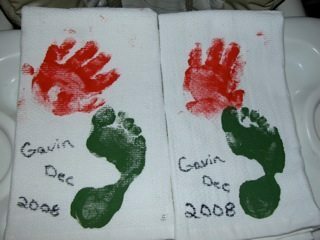 One activity I love to do with my boys is crafts with footprint and handprints. My friend actually told me about this blog a couple of years ago and I started following it. 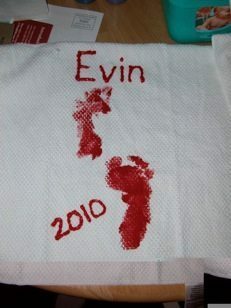 Next thing I know Handprint and Footprint Art is on Facebook and I can follow things there. Then Amanda contacted me to guest blog! I love all the ideas we can find here from her. 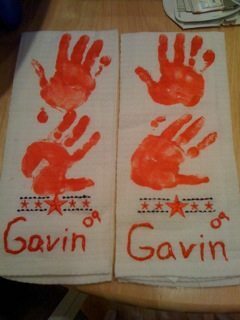 Our annual handprint and footprint project is to create a dish towel for the grandparents and of course I need one for my oven each year too! I start looking right after Christmas each year for cute, inexpensive ones that I see. The best place I have found to get them is the Dollar section at Target. They have had some really cute ones and they are $2.00 or less, which is a great deal. I store them away in a closet with Christmas items for safe keeping. I use the acrylic craft paint in the small containers that you can find at Walmart and Michael’s for about $1.00 a piece and you have plenty of color options. 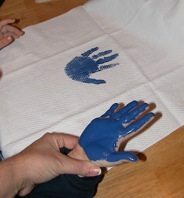 This paint washes off easily with soap and water from little hands and feet. 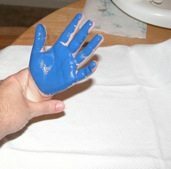 Paint the paint onto the hand or foot of your choice and coat it liberally. Then press the hand or foot firmly onto the towel. After pressing firmly, wash the hand and repeat with the other hand. However you choose to do it, make it fun for you and your child. There are so many options- hand and foot, two hands, two feet….. My youngest wasn’t fond of doing his hand until this year so for two years I did his feet. I sat him in his high chair and strapped him in. The chair kept him still and I was able to press his foot against it better placing something firm underneath the towel. I take a plastic cover and tape the end of the towel to it so it doesn’t slide. Then I press the lid against my stomach and press the foot against the towel. Works great with little kids to have them strapped in a chair! The first year I did this, I just used a sharpie to write the name and date on it. 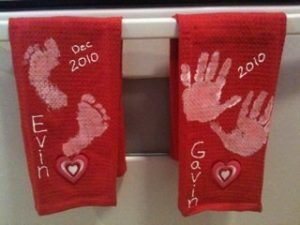 After a washing it a few times that is starting to come off so I highly recommend using the fabric paint to write names and dates on the towels. Make sure to let it set flat before gifting it and especially before washing it. 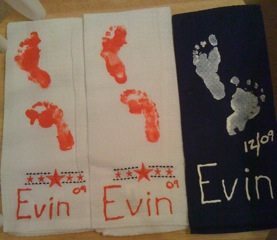 Here are all of our creations with dish towels the last four years! 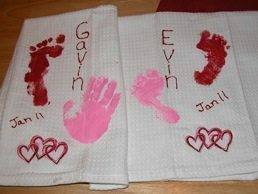 The grandparents love getting these and so does mommie even if I help make them. I love having them to look at all year long. We give these at Christmas but they are perfect for Mother’s Day, Father’s Day, birthday’s or just because. Practical gift that can be used and saved for years. My parents and in-laws have loved them every year!! If you have a question I didn’t answer here or need help with this project, drop by my Facebook page or my blog Ally’s Helpful Hints For Mommies and I would love to help you out. 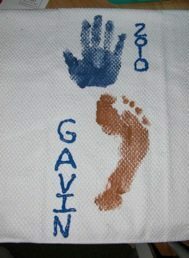 You can also search my blog for handprint and footprint and several posts will come up with ideas as well. Thanks Amanda for letting me guest post today! I love sharing my ideas! !